Dir: Peter Jackson. United States/Estados Unidos, 2013. 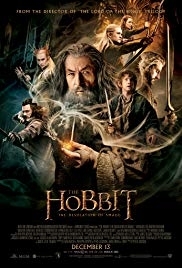 The dwarves, along with Bilbo Baggins and Gandalf the Grey, continue their quest to reclaim Erebor, their homeland, from Smaug. Bilbo Baggins is in possession of a mysterious and magical ring. Recommended for ages over 11. Bilbo y sus companeros continuan su viaje, enfrentando peligros de camino a la Montana Solitaria, donde encuentran al terrible dragon Smaug.